These are steampunk short stories and novelettes set in an alternate world of the 1880’s, featuring Henry Emerson, an upright but coarse airship pilot in the British Royal Air Navy, and his good (though exasperating) comrade in arms James Billingsworth, along with their intimidating Sikh friend Raheem Aranjapour. From rescuing stranded generals in the forbidding desert of Sudan to racing against time to foil an assassination plot right at the very heart of Victorian London, the trio faces perilous odds and incalculable danger in every corner of Britain’s world-bestriding Clockwork Imperium. The first short story in the Clockwork Imperium series. Their superiors call it insubordination. They like to think of it as following orders…creatively. The resulting adventure could bring them glory and fame, or doom them to a torturous, painful death at the hands of savage tribesmen. That is, if their own commanders don’t get to them first! To Rescue General Gordon is an 8,000 word (35 pages) steampunk novelette. The second short story in the Clockwork Imperium series. For someone means to assassinate the Queen, and Henry will risk everything to stop them. Queen Victoria’s Ball is an 8,800 word (38 pages) steampunk novelette. Venus in 1887 is no paradise. Hardy colonists eke out a meager living cultivating blue Kosh root to ship back to Earth via aether transit, and traders and explorers brave the deadly foliage and even deadlier fauna of the Aphrodite continent’s inner forests in search of riches. Lieutenant Albo Collins has just come to Venus straight from graduating West Point, and the young officer craves more to do than cleaning drunks off the streets of New Philadelphia. When the governor orders the First Venusian Colonial Infantry to the northern border of the colony Collins gets his wish, but as he marches into the unexplored wilderness hot on the trail of Federalist raiders, he has little idea what horrors await him, in the shade of the Ishtar trees. 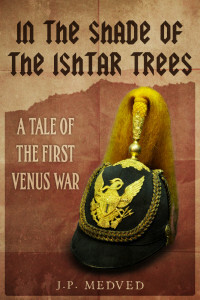 In the Shade of the Ishtar Trees is a 10,000 word (40 pages) steampunk novelette. A charismatic new governor. A radical political movement. An overzealous central government. When libertarian Republican candidate Paul Spooner is elected Governor of New Hampshire, his policies set the tiny, independent-minded state on an inevitable collision course with the Federal Government. President Bennet Oliver can’t let his signature new healthcare law fall prey to the failings of similar, previous Democratic legislation, so he decides the defiant Granite State must be made an example of. 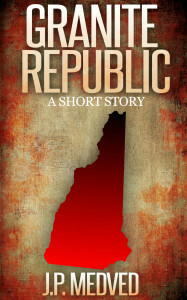 A story told through news clippings, video transcripts, leaked documents, and gripping first hand accounts, Granite Republic details the explosive stand of one small state against a tyrannical national government. Granite Republic is a 12,500 word (50 pages) epistolary novella.